← Baby Birthday Cake Pancakes!! Well, hello again! It’s been almost three weeks now since the birth of our third son and we’ve all been enjoying our babymoon period with the new little guy. Though it’s only been a few short weeks, it feels as if he’s always been a part of our family. Life is good. And aside from the growing deficit of sleep, we’ve all adjusted nicely to our new routines as a family of five. My meal plan for the first few weeks was simple. I had no intention of cooking anything. 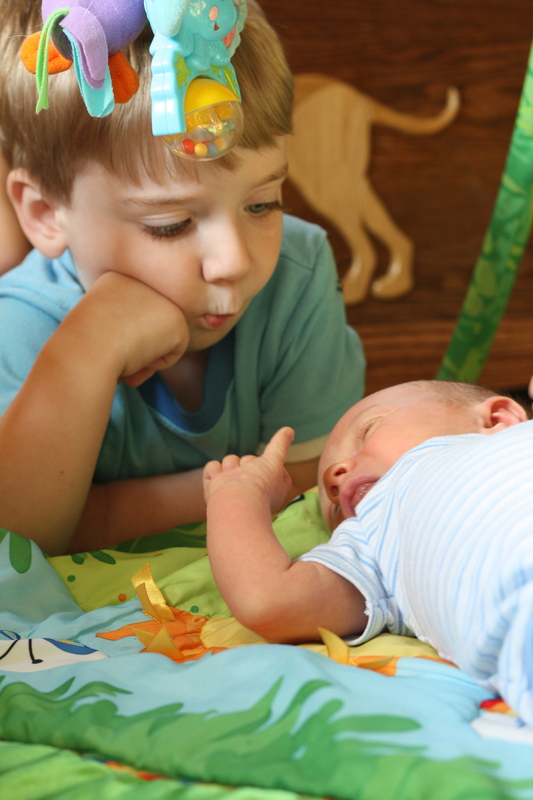 We’d keep things simple and easy while we focused on adjusting to life with our newborn son. I’d prepared a couple tins of baked ziti and macaroni and cheese in advance and stocked the freezer with frozen pizza and a few packages of our favorite frozen chicken tikka masala (with plenty of garlic naan, of course). Takeout from our local Panera and Five Guys would round out our no-fuss dining options for the first few weeks. Well, it took my husband all of a week before he went stir-crazy with the frozen foods and takeout. I knew he’d reached his breaking point when he came downstairs with a cookbook in his hands and started asking questions about the flavor of cumin and how to poach chicken. Apparently, one week is the frozen food and takeout limit for someone who is accustomed to home-cooked meals. Now, my husband has many talents, but ever since he tried to cook the cardboard packaging along with a frozen pizza, I have a hard time handing him the reins in the kitchen. So, one week after the birth of our son, it was back to the kitchen for me. And somehow, with a few little tweaks to our routine, I’ve managed to put food on the table each night (and my husband has put down the cookbook). Slightly-frazzled, busy moms (such as myself) will appreciate the simplicity of this make-ahead, one-dish meal. 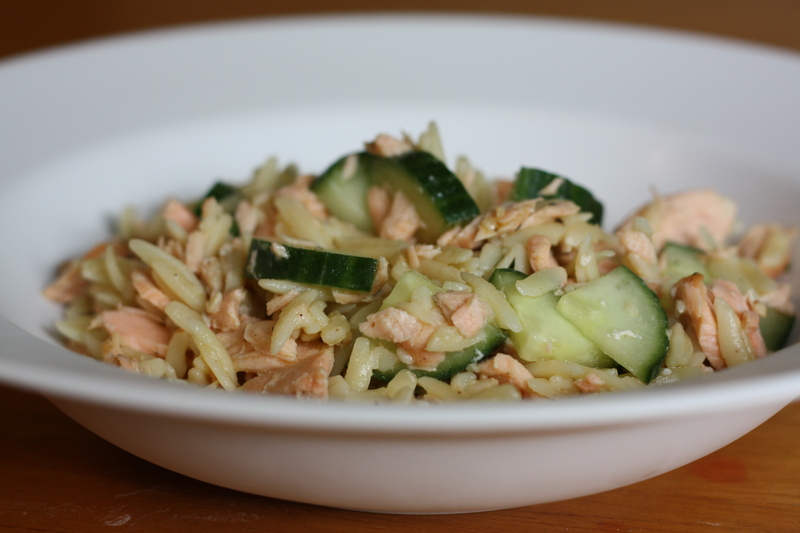 Broiled salmon is combined with crisp cucumber slices and orzo pasta in a flavorful lemon-dijon vinaigrette for a refreshing dish, which would make a perfect addition to any summer potluck! The entire dish can be prepared ahead of time and is served cold, leaving more time and flexibility to enjoy the warm days with family and friends. Preheat broiler. 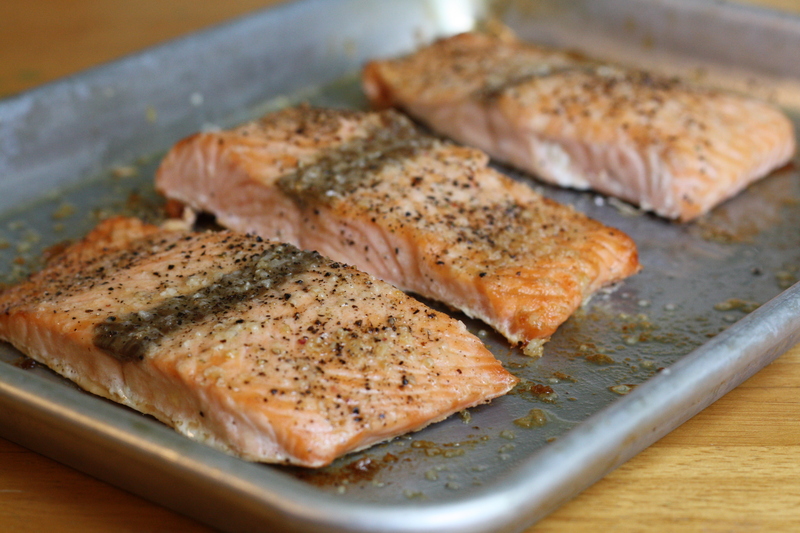 Place salmon fillets on a baking sheet. Drizzle with a bit of olive oil and season with salt and pepper. Place the salmon several inches below the broiler and cook for about 10 minutes, until cooked through. Cool completely, then break or chop the salmon into small pieces. Cook the orzo according to package directions. Rinse with cool water. To prepare the vinaigrette, whisk together the lemon juice, olive oil, mustard, and garlic. Season with salt and pepper, as desired. Add the salmon, cucumbers, and parsley to the pasta. Toss with the vinaigrette, adding a little at a time, until the salad is well-dressed. Refrigerate until ready to serve. Serve cold. Posted in Food, Main Course, Recipes, Salads, Seafood, Side Dishes, Vegetable and tagged Cooking, easy dinner, family, fish, Food, kids, parenting, pasta, potluck, Recipes, salad, seafood, spring, summer, vegetables. Bookmark the permalink. How wonderful that you are all settling into a routine so quickly. What a great idea your salmon salad – it sounds super tasty. 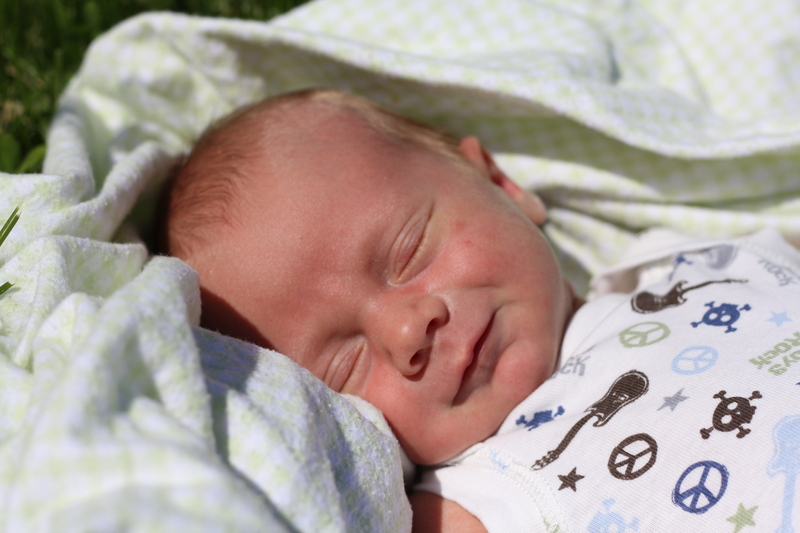 Your little one looks so content in the sun.